When I lived on my parents’ farm in Ohio, I used to install Beverages. That was back when copper was cheap and I bought 500-ft rolls of #14 THHN for $10 each. N8ET gave me some ferrite toroids (of unknown mix, probably 77) and I added some parts from RadioShack to build some killer listening antennas. 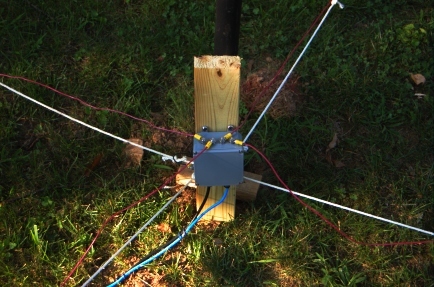 The best setup was three unterminated (bi-directional) ones that covered the compass. 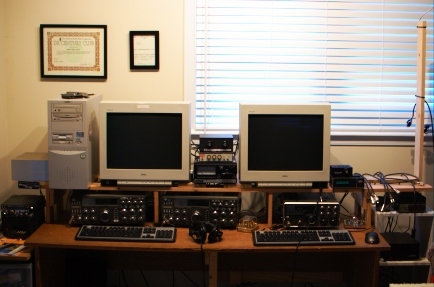 When I lived in Minneapolis, I went to W0AIH to operate the low bands. And, when I lived in Urbana, IL, I didn’t operate 160 and didn’t need the low-noise receiving antennas—or I went to NO9Z. Now, I live in the suburban wasteland between Washington and Baltimore. It was time to do something about the receiving situation. Armed with my (autographed, no less) copy of ON4UN’s Low-Band DXing, I began thinking of what options I had. 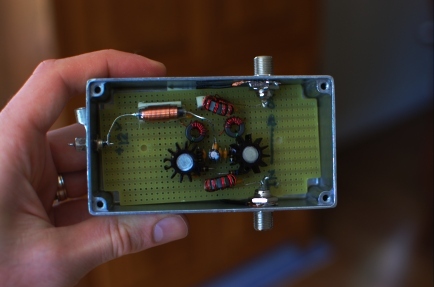 A small RX 4-square developed by K9UWA, W8JI, and others was appealing. But, it’s too large to fit comfortably on my lot. I considered a pair of short verticals with a phasing box (a project that has been in my queue longer than any—since 2003). But, I ended up settling on the K9AY “loops” because they are small and portable, having an integral ground radial and a single ground rod. When I lived in Urbana, I had considered doing a set of K9AYs. So, I had purchased the parts to build a nice balanced preamp based on a QEX article by IK4AUY (this design is actually based on an even older Ulrich Rohde design). Note that the version of this preamp presented in ON4UN’s Low Band DXing, 4th edition, is wrong—if you see IK4AUY’s web site you shouldn’t miss it. Several months ago, I had assembled one on a perfboard (and tested it—so I thought). When I tried the preamp again over the weekend, it didn’t amplify the signals on the antenna side. The 2N5109 transistors are heat-sinked and so should get warm to the touch during operation. They did not. This suggested that they weren’t even being biased properly. So, armed with a DMM and the schematic, I started following the Vcc line. Megaoops. I failed to connect the collectors to Vcc. That fixed the problem and the preamp worked like a charm. I built the classic K9AY crossed loops at 90 degrees for four-direction switching. Here’s my switchbox (built using 48-volt relays scavenged from the AT&T Long Lines system in the post “Resume of a Master Dumpster Diver“). This box may have layout problems. If you’re an expert on K9AY loops, please weigh-in. The terminal strip at right is for the control wiring. I had originally planned to run Siamese RG-6 (scavenged from a DBS installation initiated by some lying, theiving, lazy, pot-head, good-for-nothing duplex neighbors we had in Urbana—they also discontinued our shared “free” Cable) so the loops could be independently switched and shared between two transceivers. But, when I suggested this idea to K9AY, he told me that the loops couple strongly with each other unless the unused loop was left floating. (If this idea actually did work, you could use two transformers on each loop, one in place of the termination, like a reversible Beverage…hmmm…for maximum flexibility.) 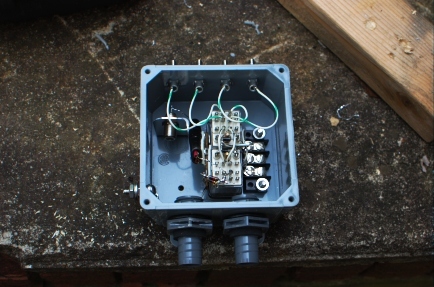 Instead, I built the regular control box, with a scrap of CAT5 cable as the control cable. The loops are 80% of full size due to the amount of space (and wire) I had available. I terminated them with a 330-ohm resistor, although I’m having a hard time getting a null. Unfortunately, this is one of the best sites in my yard, yet it has a rusty metal fence (i.e., lots of little diodes on a big antenna) on two sides, a 30-ft mast and my 80-meter vertical on the other two sides. So, it’s not entirely unexpected that I’m not getting a null. I suspect that the neighbor would let me install it in his back yard, but I don’t want his landscape guys to hit the cables. This may become an option. Ohio is my home state (hence the W8 callsign) and I thought I’d get on to work a few old friends. I was surprised and pleased to work former co-worker WB8JAY although I’ve changed callsigns since we worked together and I don’t think he recognized me. We had friends over for dinner, so I only got two and a half hours in. The big bummer of the Qhio QSO Party is the RTTY contest. It seems like there’s a lot of bad blood between RTTY and CW ops. I think a lot of it comes from the fact that they can’t (as a CW op, I consider RTTY ops to be functionally-illiterate at CW because they’d be using CW if they weren’t) copy each other’s signals and therefore treat each other as just another interfering signal. One man’s signal is another man’s noise, as we like to say in the remote sensing business. This score looks familiar, but the distribution by band is different. Need more practice! So, I have some work to do. I was getting up into the 40s of QSOs when I left off two years ago. More sprints! Increase the height of the antenna. This is impractical at the present QTH without installing a tower. Actually, the tower would have been possible but I wasn’t ready shoot first and ask questions later with it. Nor was I ready to have my folks spring some Rohn 25G out of storage in their garage for the trip here when I had the opportunity (a truck bringing some furniture from them). Run lower-loss cable. I have regular old RG-8 (PE dielectric) running up to the antenna. It’s only about a 50-ft run. So, I’d be hard-pressed to do a lot better. I did figure out how to recycle improperly-installed N-connectors for LMR-600 from a dumpster-diving excursion. Although I have twenty-some connectors, I haven’t yet secured any scraps of LMR-600 to use. This is a future consideration. At $1.50/ft, LMR-600 would still cost $75. No deal. Stack multiple 6-element antennas. This is actually a good idea that I’m keeping in the back of my head for the future. 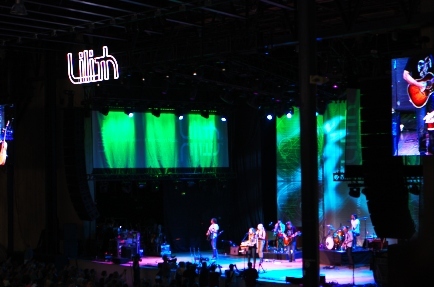 It would be nice to do something like this. Maybe some day. Launch a rocket to do a chemical release whenever/wherever I needed a sporadic-E layer. Unfortunately, you can’t launch rockets over land. (Update: I was reminded later that this is not 100% correct.) Furthermore, at a megabuck per shot, it’s not cost-effective. Dispense with the 6-element design and go for something bigger. The first step was to consider suitable designs. I tried scaling the 11-element 432-MHz cheap Yagi to 144-MHz. Fail. A NEC model showed that the pattern stunk and the input impedance was pretty far from 50 ohms. 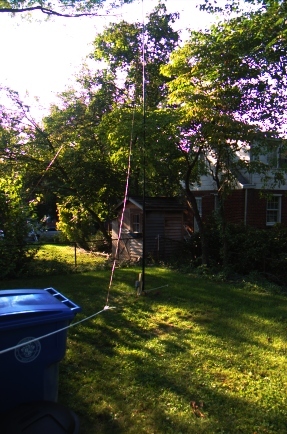 Knowing that W5UN had built an array of wood-boom antennas for his EME setup, I looked into readily-designed options.